Stellar at 1-Altitude has long been known for it’s amazing dining view of Singapore—Marina Bay Sands on one side and the private rooms overlook The Padang. The view is even more amazing during dinner service as the sun sets and the tones of the bay gradually transition to a landscape filled with magical light shows. This sets the perfect mood for an intimate dinner with a partner or even groups of close friends. The seating in the restaurant is spaced out to ensure enough privacy for each table. Aptly named, the dinner menu “Constellations” consists of various sets featuring ingredients of the season. 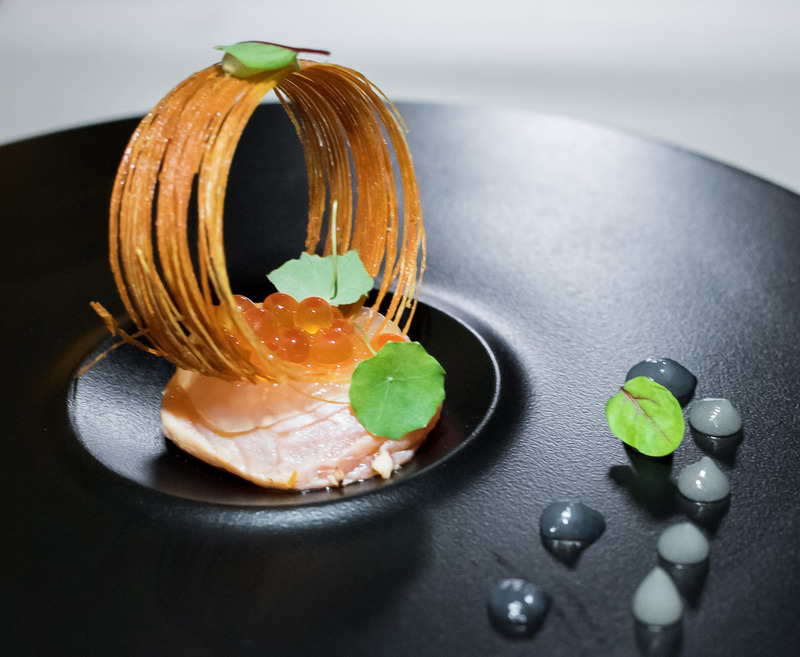 From now till 15th September 2016, Stellar is featuring a unique Kokumi Constellation menu by Chef Christopher Millar who was inspired by ingredients from Kyoto and Hokkaido during his travels. This 8-course gastronomic adventure begins with a few amuse bouche from the chef to kick start your taste buds. 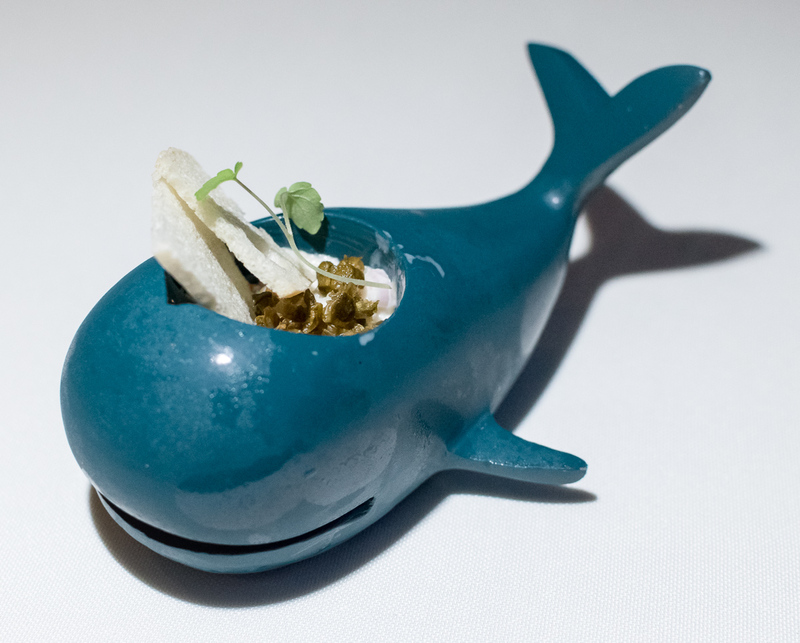 The first serving triggered a smile upon our faces with it’s presentation in a whale-shaped serving dish was followed by two other bites including an egg tofu with dashi jelly. 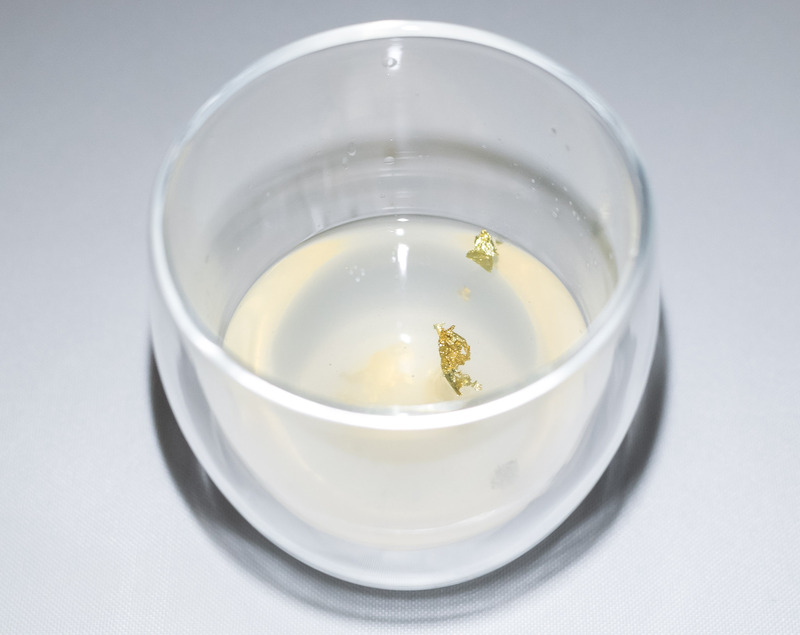 The Kokumi Constellation menu commences with this “Tea Ceremony” of clear fish consommé, presented as a dashi capsule. The capsule fades away and gold leaf dances around in the glass as the waiter adds hot water using a tea pot. A light dashi flavour to start the meal, this is paired with a 2014 Sato Reisling that has a subtle sweetness. The 2nd course is “Raw” Hamachi which sits atop shoyu jelly. By the side sits an edible fish net which seems to have caught itself some vibrant edible flowers. 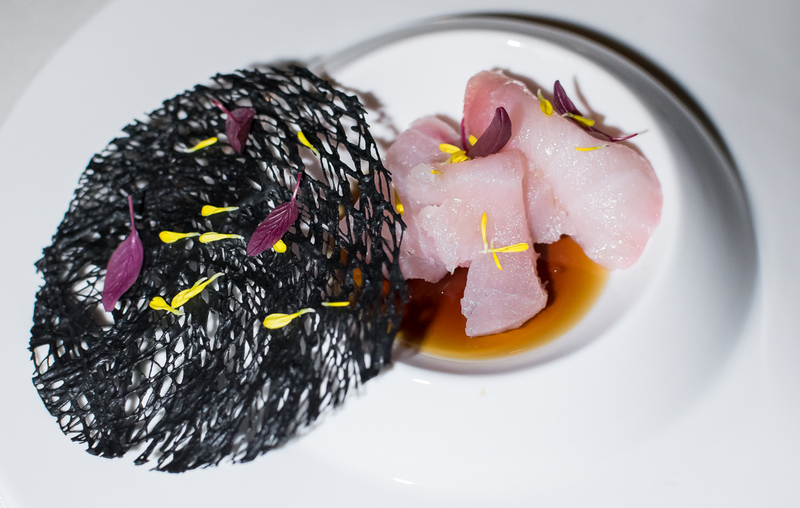 This charcoal fish net adds a contrasting visual and taste to the salty shoyu and fresh hamachi. The shoyu in jelly form gives the dish an additional texture and makes it easier to scoop up with the hamachi—those who love salty flavours will enjoy scraping up every last bit of jelly. The “Steamed” Hokkaido oyster custard was next. 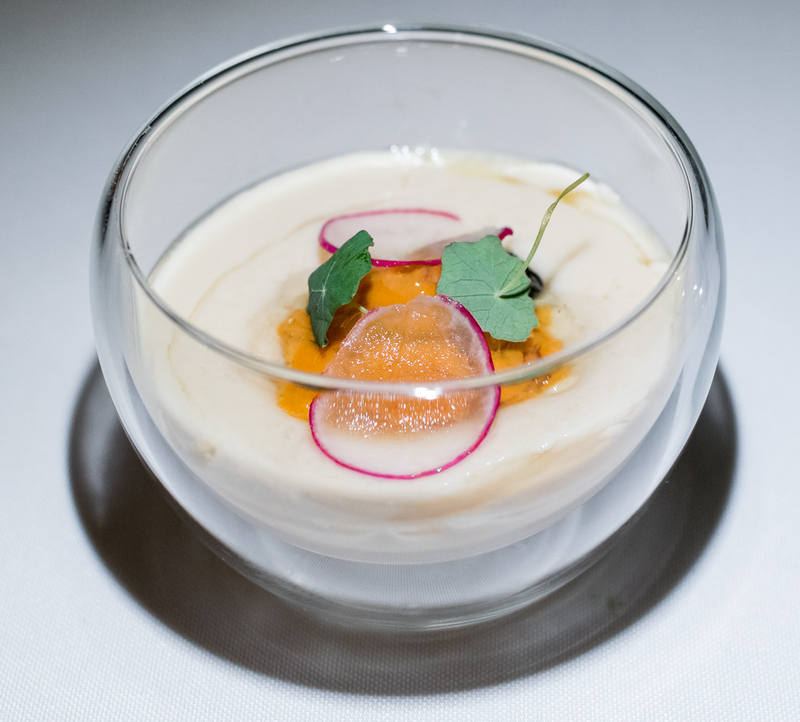 Nestled atop the custard is a Kita Purple Uni—this seasonal Uni from Hokkaido has a lighter and more refined taste so it doesn’t overpower the silky custard. 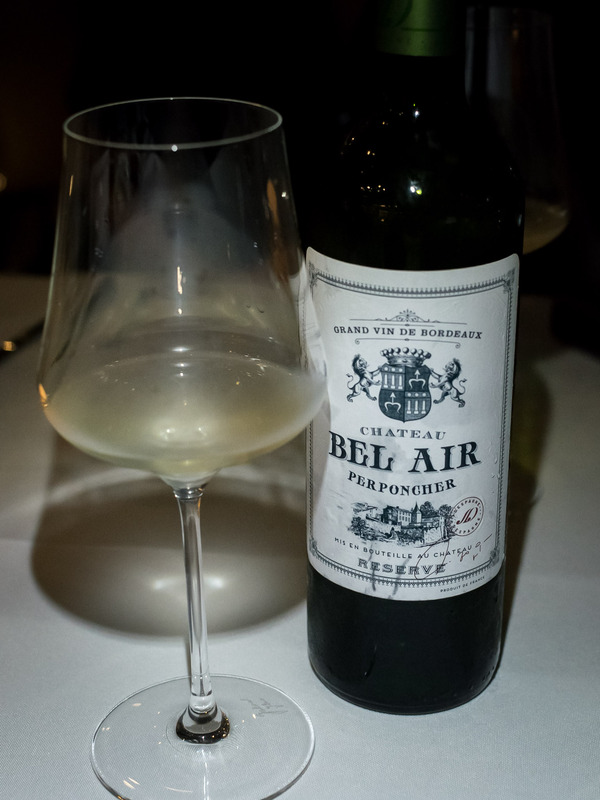 Accompanying this course if you opted for wine pairings, is the 2015 Chateau Bel Air Perponcher Blanc which has sweet fruity flavour and is very easy to drink. As we move on, the tastes grow a little heavier, starting with this mini “Pan Fried” Foie Gras burger. A coin of foie gras and thin slices of Japanese egg plant is sandwiched between fragrant, soft, warm “mochi” burger buns—and it’s truly the buns which makes this dish incredibly comforting to devour! 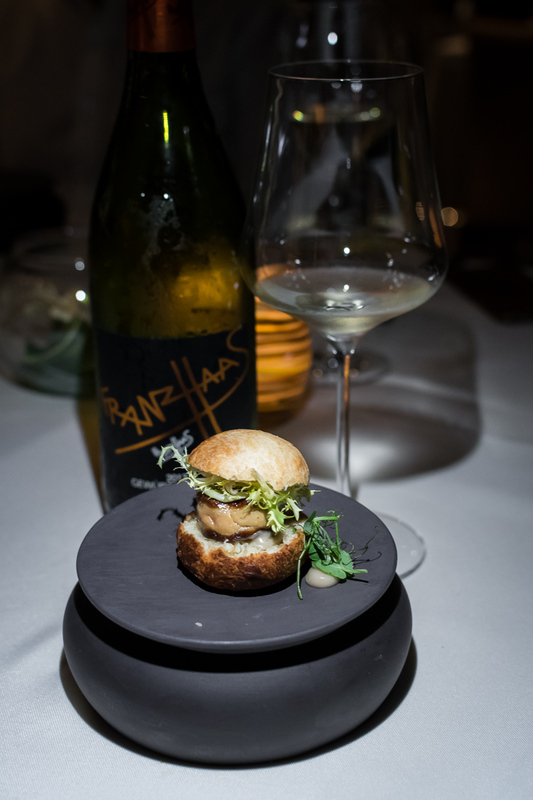 Complemented by a 2013 Franz Haas wine, which is a little dry on it’s own, but evens out with flavours from the foie gras burger. On to the 5th course of “Pan Fried” Banka trout. 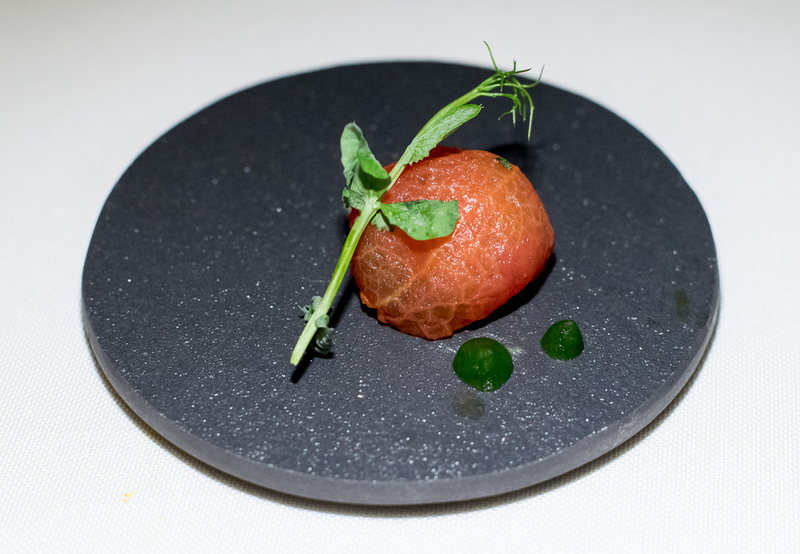 With lots of different textures—from the crisp carrot coil to the tender trout and sweet ikura, this was definitely a favourite. Subtle flavour from all the elements including the prawn oil and yuzu makes this dish a fun adventure for the tastebuds. This dish is best paired with a 2012 Ginza Soumei Extra Brut Reserva. 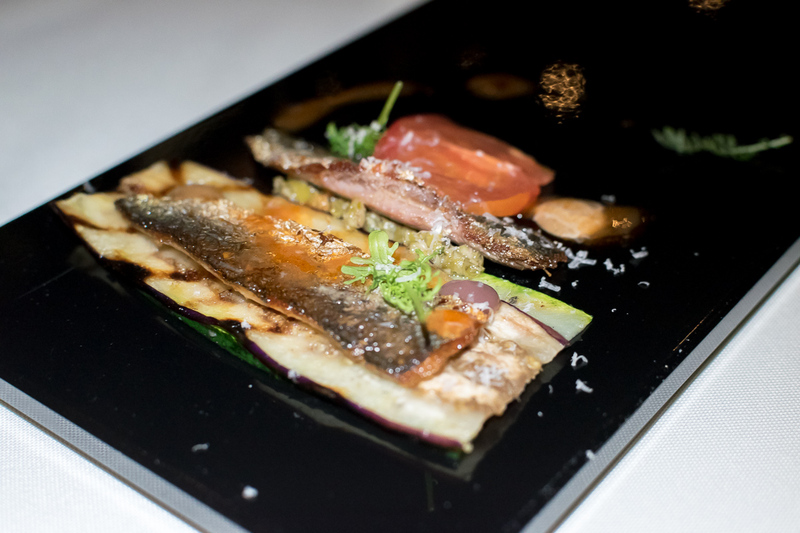 The last seafood course was the “Grilled” Japanese sardine. One fillet served with seasonal Momotaro tomato “ratatouille” has more tangy notes, whereas the other fillet with egg plant had a more savoury taste. The sardine did not have a strong fishy flavour, that comes to mind when sardines are usually mentioned, which allowed us to taste more of the seasonal ingredients used. This dish is paired with a 2015 Ginza Soumei from Spain. 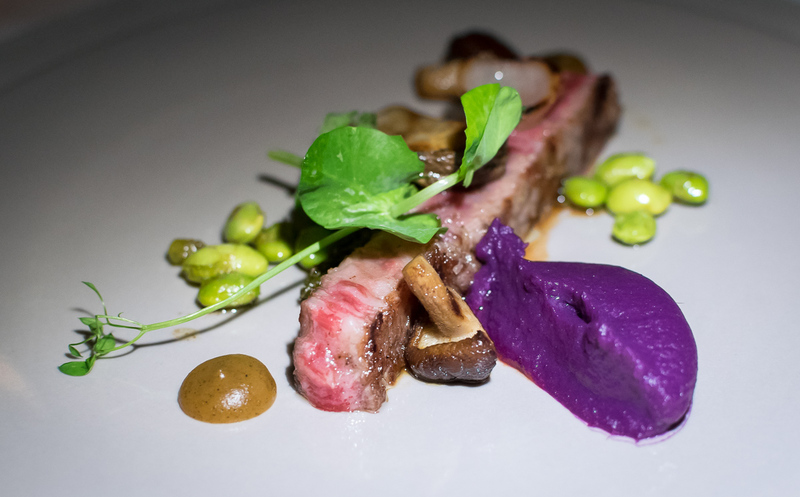 The last course before dessert was the “Smoked” Josper grilled wagyu A5 rib eye with edamame, orange anticucho sauce, sweet potato puree, mushroom pickled and caramelised shallot. A hearty, well-balanced end to the night of savoury dishes with melt-in-the-mouth Wagyu which never fails to disappoint. For those opting for wine pairings, this dish is accompanied by a 2012 Chateau Mont-Perat Rouge. Dessert awakened our senses again with an eye-catching presentation by Chef Jasmin Chew from Stellar. 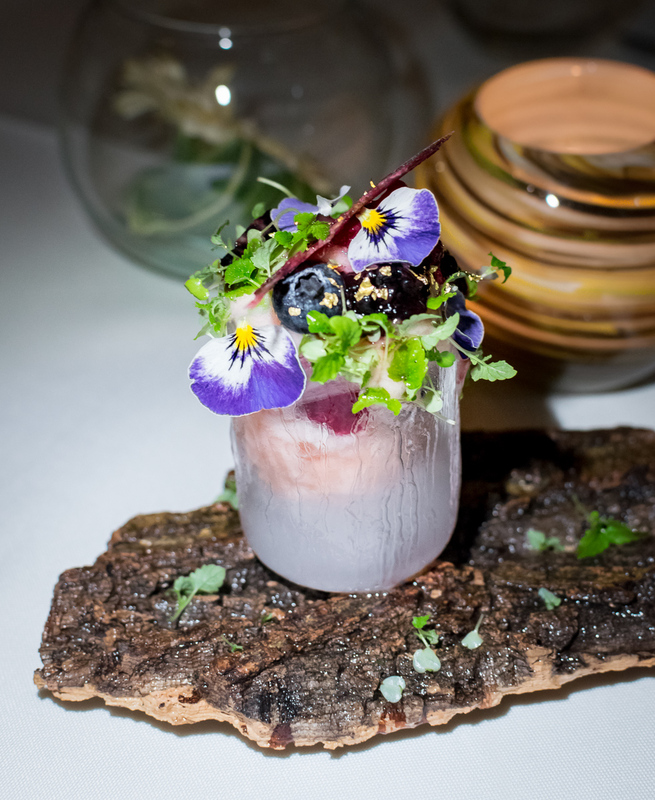 This “Sorbet” White peach lychee sorbet includes compressed peach, Sauternes and berries. The peaches featured are sweet seasonal Okayama white peaches which have a history of being grown and ripened with tremendous care. 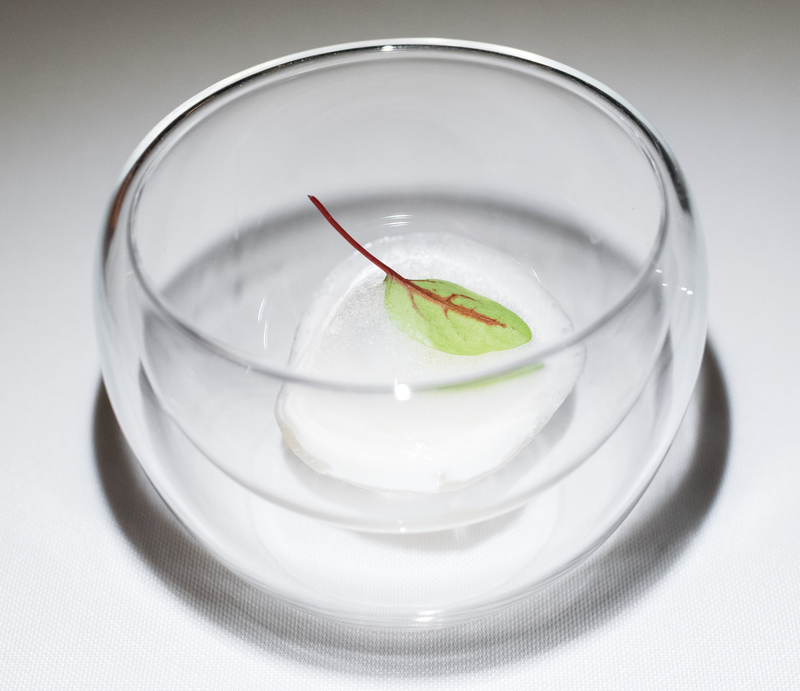 The entire dessert sits in a cup made of ice and is presented on a bark platform that gives the entire dessert a very earthy, yet fresh character—almost feels like it’s appearing from a rainforest on a dewy, chill morning. And this is paired with a very fruity 2013 The Bothie, Muscat a Petits Grains from Australia. Satisfied from our meal and dessert, we were presented with our petit fours to end the night. 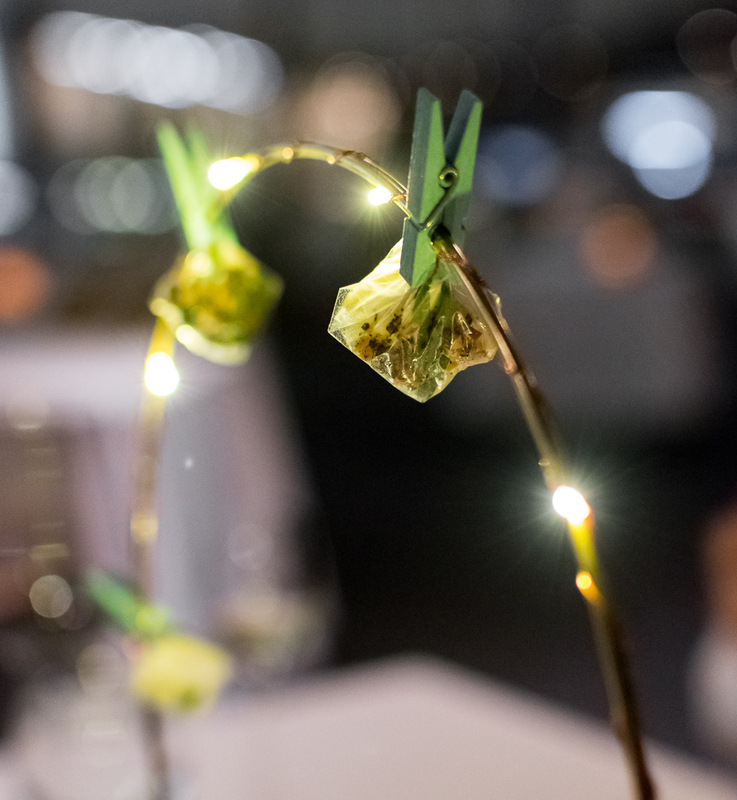 The angelic display with bright glowing led lights held little packages filled with tarragon, mint and lemon balm. Pop the delicately wrapped sweet in your mouth for the wrapping to melt away. Inside, the slightly chewy and creamy sweet is minty, almost tasting like a Mintie sweet or an After 8 chocolate. Can’t think of a better way to end the night of delicious food. This dinner is a little taste adventure perfect for a chill night overlooking the skyline. Leave about 2 hours to savour the courses and a little more to sit back with a glass of wine in hand. Minimum 2 pax per table to enjoy the Kokumi Constellation menu.